When Does a Will Have to Be Probated? Does a Will Always Have to Be Probated? Does a will always have to be probated? Not necessarily. A number of circumstances might make probate unnecessary, but the rules can vary by state. Many states make other options available, and some exceptions are universal. People often own assets in joint names with their spouses, their children, or others. If an asset is owned jointly with "rights of survivorship," it passes automatically, by operation of law, to the surviving owner or owners. This means that probate isn't required and, in fact, the decedent doesn't have a legal right to include his ownership interest in the property in his will or bequeath it to anyone other than his co-owner. If he did include such a provision in his last will and testament, the court would not uphold it. A will that passes on—or attempts to pass on—only this type of non-probate property cannot be probated. Other assets are "payable on death" to one or more designated beneficiaries and these avoid probate for much the same reason. They pass automatically, by operation of law, to the designated beneficiaries. The accounts or proceeds go directly to these individuals. Many people buy life insurance policies to provide income replacement and a money source for paying off their debts when they die. 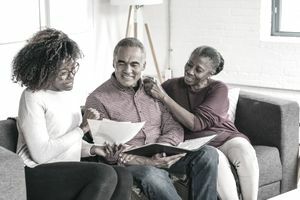 Because these death benefits pass automatically and directly to their beneficiaries under the terms of the policy contract, they don't become part of the deceased's probate estate. They, therefore, cannot be transferred to other beneficiaries according to the terms of a will. Many people invest in retirement accounts, such as 401(k)s, IRAs, and annuities to plan for their retirement. If the account owner should die before using up the entire account for his retirement needs, the account would pass automatically by operation of law to its designated beneficiaries. Again, probate is not required. If a will bequeaths no other property that doesn't pass to a living beneficiary by operation of law, it cannot be probated. If the decedent formed a revocable living trust and funded his assets into the trust, they would not require probate because living trusts avoid probate. They allow a mechanism by which assets can pass to beneficiaries under the terms of the trust agreement so probate is not required. But many people who form trusts also create something called a "pour-over" will. This type of will is designed to catch any assets the trust maker neglects to place into his trust for one reason or another. It then transfers them to the trust at the time of the trust maker's death, and this type of will would require probate even when a trust exists. Probate is required to transfer property out of the name of a deceased individual and into the name of a living beneficiary when the asset is not set up to transfer directly by operation of law. But an exception exists even to this rule and some estates might not have to be probated. Virtually every state offers some form of abbreviated probate proceeding for small estates with values under a certain dollar amount. The deceased's property can sometimes be claimed by beneficiaries with an affidavit approved by the court. A surviving spouse or child might simply take the affidavit to a bank or other institution and take ownership of the property under its terms. Even if your state doesn't offer this option, most provide for ​a summary or simplified probates with less court supervision and fewer legal requirements when an estate is small. Consult with a local estate planning attorney to find out what's available in your state. State laws change frequently and this information may not reflect recent changes. Please consult with an attorney for current legal advice. The information contained in this article is not legal advice and is not a substitute for legal advice. Who Inherits Without a Last Will and Testament in Colorado? Who Inherits From You Under Idaho's Probate Laws If There's No Will?